As I mentioned last month, I’ve really enjoyed cooking my way through Isa Chandra Moskowitz’s Appetite for Reduction. It’s pitched as a healthy eating book, but is also fine if, like me, you’re not dieting. I did kind of stumble into an accidentally healthier month than expected, thanks to a step-counting fitness challenge at work. 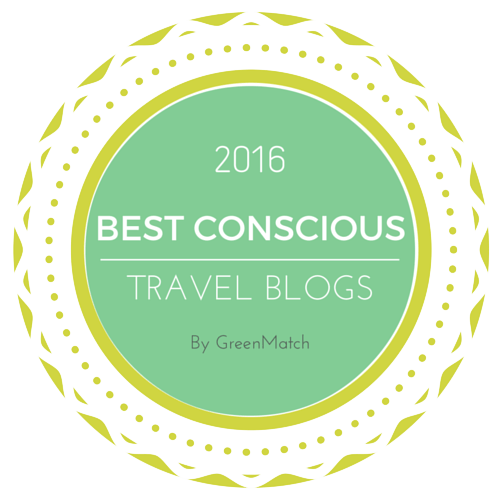 That combined with these vegetable-based dishes made me feel very smug indeed! Let’s start with salad, then! 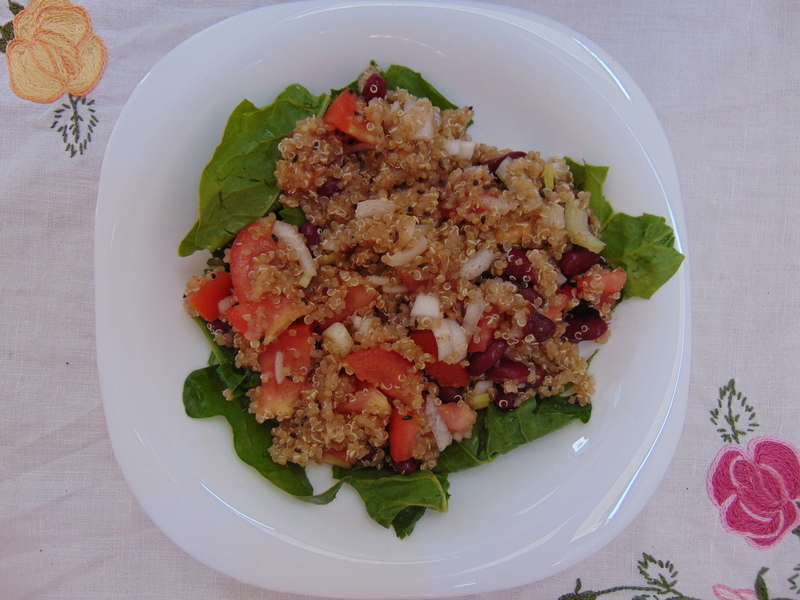 I found the quinoa salad with black beans and toasted cumin seeds a little dull, actually – the only real seasoning was the cumin seeds, and it needed a bit more for me. I think we ended up throwing in some smoked tofu, which helped liven things up. Generally, I enjoyed the salads in the book, but this one fell flat. 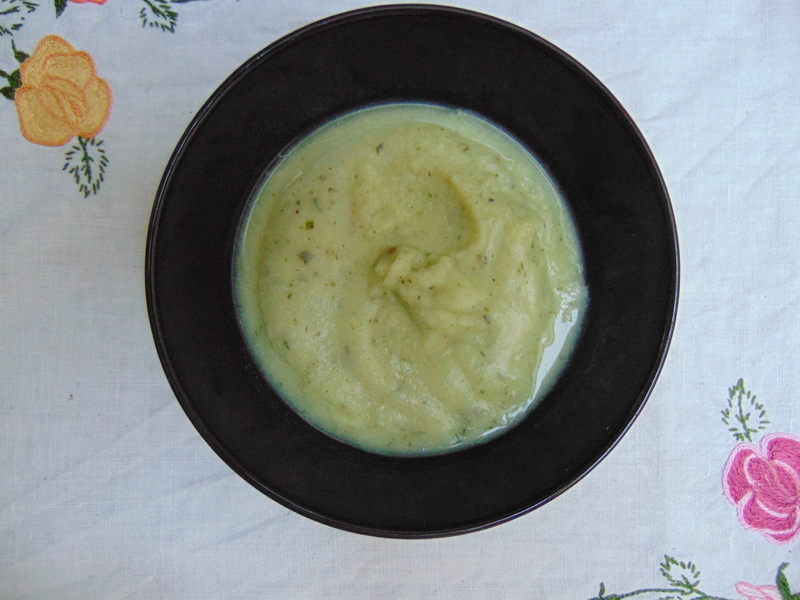 I had really high hopes for the cauliflower pesto soup, but it turned out tasting quite bitter – I think this is down to the cauliflower, as there’s no reason anything else should have had that effect. It’s a great idea for a recipe, but just didn’t quite work. 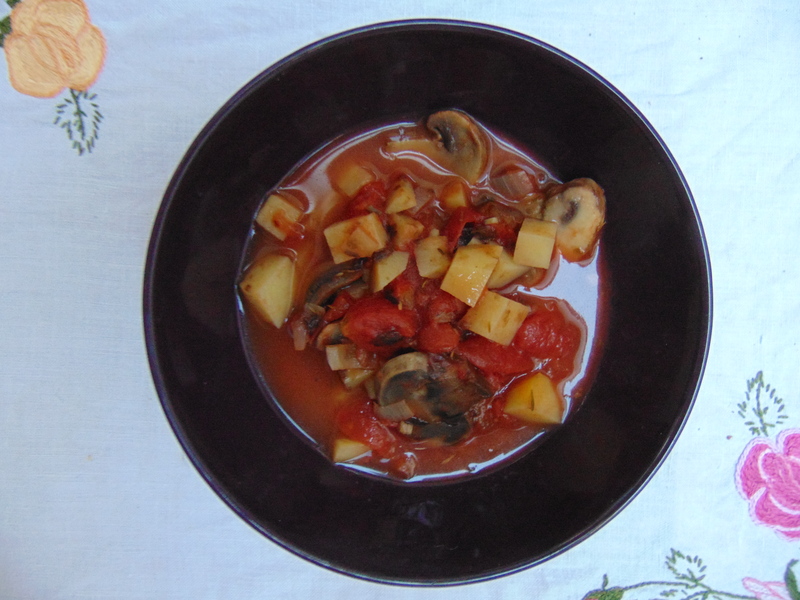 I was very excited to try the Manhattan glam chowder, as the glam chowder from Isa Does It is one of my all-time favourite recipes. Apparently the New England version from that recipe is cream-based, and this Manhattan one is tomato-based. I’m afraid New England comfortably wins this battle. The flavours here were nice, but it was kind of annoying knowing how much better it would be with some cashew cream thrown in too. Still, I’m glad to know the difference. I can’t believe I forgot to take a picture of the ceci-roasted red pepper soup. It was possibly the best recipe this month! Roasting a pepper always elevates a dish, and that was certainly the case here. The soup is only partially-blitzed, meaning that it’s quite thick and chunky- the perfect texture, to accompany the perfect taste. 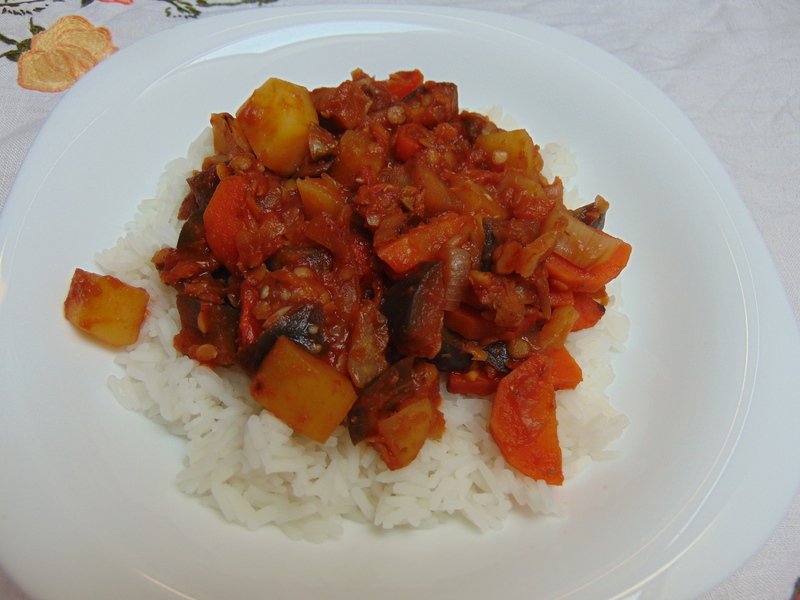 If you feel like getting a stew on, this eggplant provencal is a fine place to start. 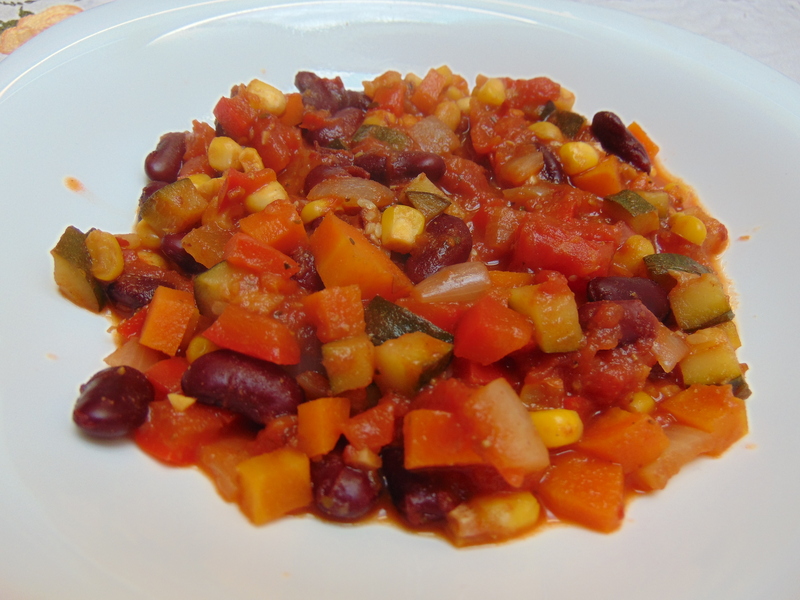 Classic flavours, lots of veg, hearty red lentils, a splash of red wine…simple and very effective. 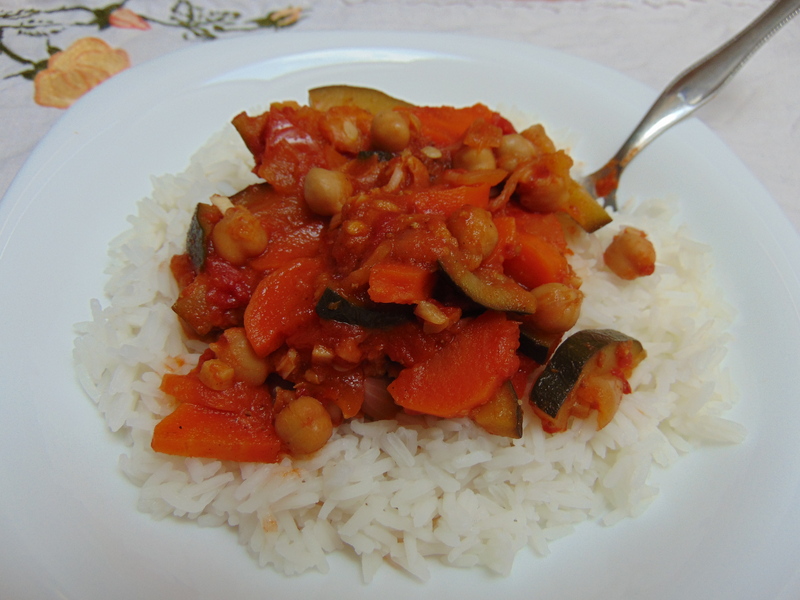 The Moroccan chickpeas and zucchini was such a simple recipe, really easy to throw together and nicely seasoned. It’s not life-changing (and not as good as Simon Rimmer’s Moroccan spaghetti), but it was very pleasant. I have a go-to chilli recipe, but still almost always try one from whichever cookbook I’m using. 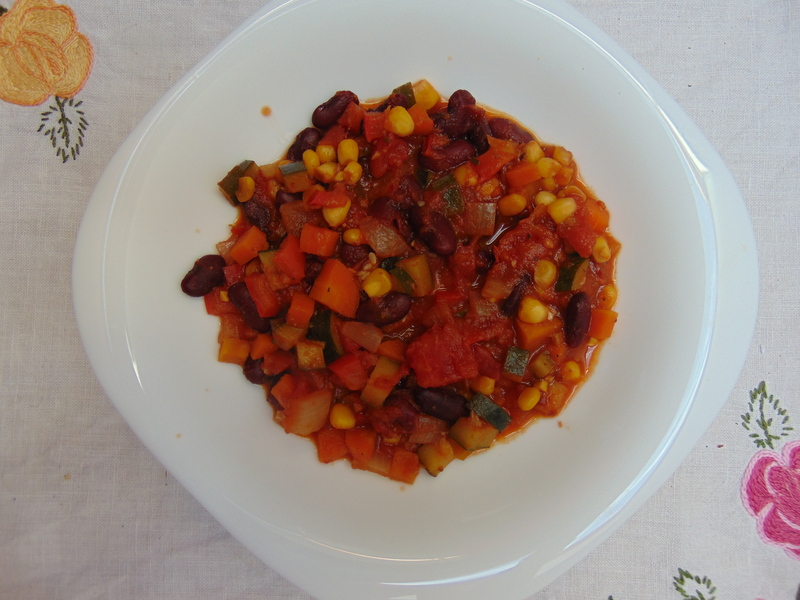 Here I gave the classic black bean and veggie chilli a go, using kidney beans instead of black beans because that’s just how life is in Prague. Truthfully, I don’t like a chilli to be too vegetabley, so this will not topple my favourite recipe, but it was still a hearty, well-seasoned chilli. The 2nd avenue vegetable korma turned out a bit drier than I’d expect a proper creamy korma to be, and I’d probably increase the spices next time too. But it was a nice mild sauce, with a good array of vegetables, and it was another one of those one-pot dishes that was easy to throw together. One of the great things about this book is that it’s quite light on the more difficult to track down items that can deter people from trying vegan recipes. There’s lots of veg, beans, and grains, and they’re easy to pick up for many people. So as well as being a good book for vegans, I think non-vegans looking to get more veg in their diet would also enjoy it and find it accessible. The lack of pictures (besides a few pages in the middle) is always disappointing, but should not deter you from the exciting range of recipes. Even after two months, I’ve barely made a dent in the book – there’s plenty of choice. As with all of Isa’s books, there’s certainly no harm in adding this to your collection! 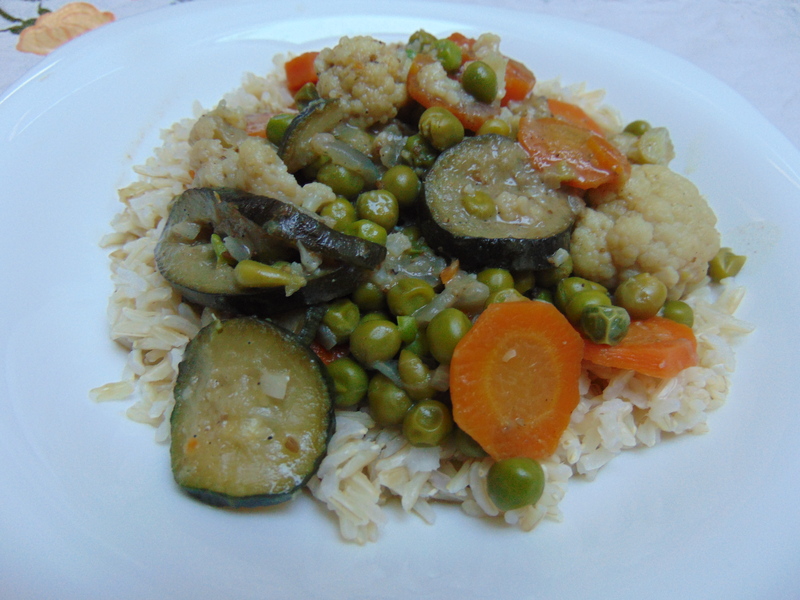 This entry was posted in Cookbooks and tagged Appetite for Reduction review, Isa Chandra Moskowitz, vegan cookbook review. Bookmark the permalink. I told my Mom to get this book because she is always trying to loose weight (she takes a lot of steroids, and as a result has gained quite a lot of weight combined with other health issues). She has made a few recipes from here. Your review reminded me about the chickpea and zucchini dish, I might try and make that tomorrow. I got a lot of summer squash! Nothing is more disappointing then having Manhattan chowder after eating the New England one. I remember getting the Manhattan chowder as a kid at a restaurant and being soooo disappointed. I mean it was still good, but not creamy and delicious. Hope you enjoy the chickpea and zucchini dish! I never knew before about the two different kinds of chowder, I’m glad I’m not the only one to be disappointed by the Manhattan version! I agree with you about the disappointing lack of pictures but I love this book and probably use it more than any other. Good tasty food and not too complicated for weeknights. Those two factors definitely outweigh the lack of pictures! I’m glad you said it’s got lots of ‘normal’ ingredients in – it’s nice to know you don’t have to go off and track down some obscure food to make stuff. The book looks like it’s got a lot of good stuff in and there’s loads more to explore – will there a review part III?! Haha, maybe in a while! I should probably give something else a try first!